As a child I was never happier than when I was drawing - usually horses! As a teenager I had to make a choice: continue my education at art college or leave school to take up a job offer to work in Carnaby Street. If you're old enough to understand that dilemma you'll guess what I chose! In my 20s I returned to college ....... secretarial college, and my career developed into office management. With multinational companies I travelled the world and during the 1980s I was living in Singapore, running a branch office. The surreal ex-pat life eventually palled so I returned to work in the City of London and then, bored with commuting, became office manager for a suburban firm of financial advisers. My career gave me little time to pursue my love of drawing until 15 years ago when I bought a set of pastel pencils and rediscovered the pleasure of drawing. 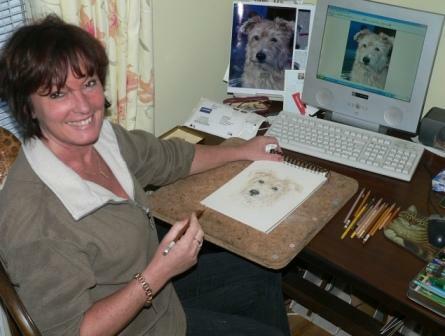 My first 'commissions' were horses and dogs based at the yard where I kept my own horse. My husband, David, built me a website and slowly word spread and a steady flow of commission requests followed. With encouragement from David I left the rat race and concentrated on building up my commission business. Despite not having a formal education in art, I joined many art communities and societies and discovered a whole new world of pencils and papers. I've attended workshops and classes which have enabled me to experiment and develop my own style. I now work mostly in coloured pencils where very fine detail is required – it is a slower process than pastel artwork but produces some beautiful results. My first portrait of a person - David, actually - was 2006 and although four legged subjects will always be my favourites, about a third of my commissions are now portraits of people. When I have time I love to draw wildlife pictures – particularly big cats.